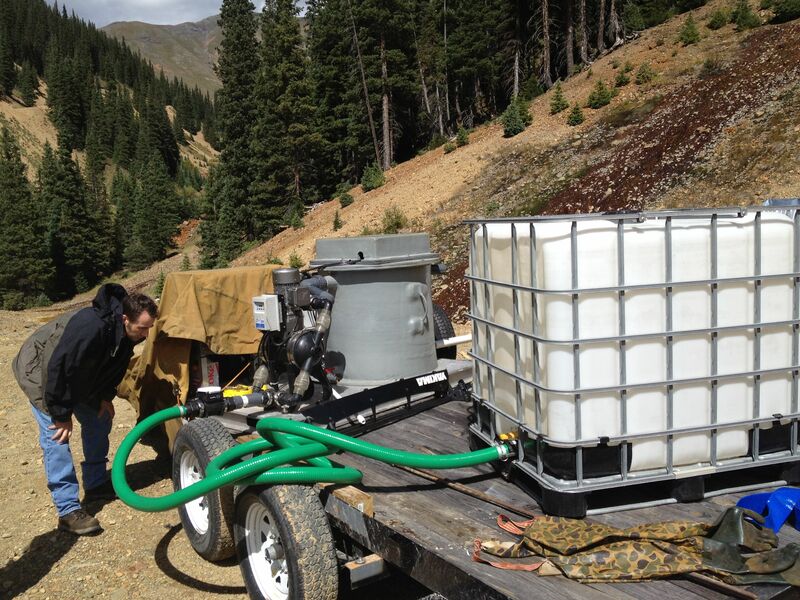 During the first half of September of 2012 Odisea participated in a pilot demonstration to treat water being discharged from an abandoned hard rock mine shaft near Silverton, Colorado. The treatment technology is typically called electrocoagulation, and the concept has been around for awhile. 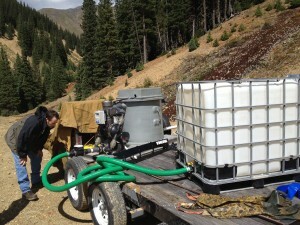 The treatment unit was supplied by Electro Chemistry (EC) of Fairfax, Virginia and the demonstration was being performed under contract with the U.S. Bureau of Land Management (BLM). 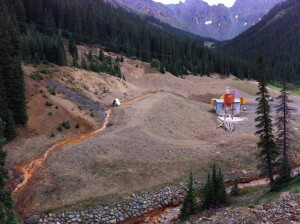 The mine water being treated is what is called adit water because it is discharging from a mine shaft. The discharge water is full of heavy metals such as zinc, lead and mercury which runs into Cement Creek making it too acidic for much life to exist. Cement Creek eventually flows into the Animas River in Silverton and then down to Durango negatively impacting aquatic insect and fish habitat. The goal of the demonstration was to determine how effective EC’s technology would work. These were some of the first results. The water on the right is untreated and the two on the left are treated at various levels of power and retention time in the reaction chamber. The results of the test were very encouraging. Zinc levels were cut in half, which were very high to begin with. The process takes no more than 30 minutes including treatment and settling to achieve the results shown in the adjacent photograph. The quality of sludge is pure without any additional chemicals. In the case of heavy metal sludge, there may possibly be a local market for the waste product of this process. Electrocoagulation can be used to treat any type of water with expected results that meet or exceed most conventional technologies at a fraction of the cost. This is because there is no addition of chemicals and no management of biological activity. In fact, the process kills all life forms in the water. Water that is currently being treated using electrocoagulation includes laundromat discharge, frack water, bilge water, industrial and domestic waste water. This technology can also be used to improve potable water from wells and treatment plants. Electro Chemistry holds a patent for the Rigby Process, which is an improvement over previous versions of electrocoagulation technology. Odisea is an exclusive representative of EC’s technology for the Western states of Colorado, Utah and Wyoming. We would be pleased to demonstrate how the process may benefit your water or waste water stream in a cost effective manner compared to your current operations. Feel free to contact Jeff at (970) 948-5744 with any questions or interest. Equipment is checked as EC sets up the full-scale unit. 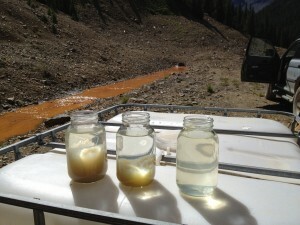 An article on the Silverton demonstration can be found here at the Durango Herald’s website.